We can reflect on a massively successful year with all of the newly promoted Dan and Kyu grades throughout the country. The triumphant multiple national domestic seminars we orchestrated and not forgetting the memorable trips abroad to train with our international Aikido friends. 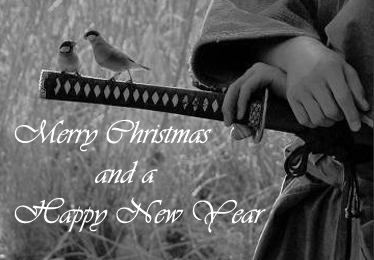 Look foward to seeing you all in the New Year folks and thanks to all involved who made 2014 such a memorable one for all at Aikikai Ireland!!! 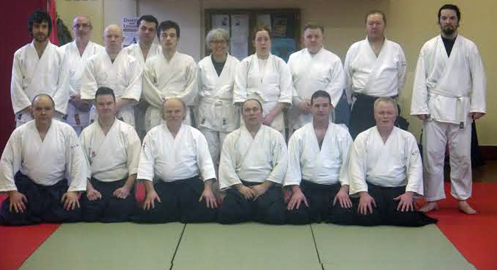 Pictured above are the group that attended the Aikikai Ireland Technical Commitee Seminar in Sligo Aikido Dojo on Saturday 6th of December 2014. Pictured below are the successfuli grading candidates after passing their exams. 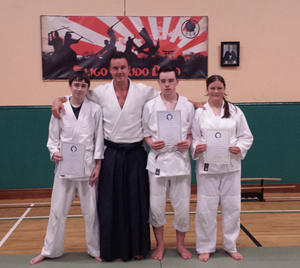 A huge well done to the following successful grading candidates at the recent course in Sligo on the 6th of December.. 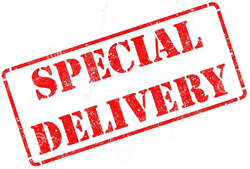 Recently Aikikai Ireland dojos had the opputunity to purchase tatami from the Slovakain Aikikai, we jumped at the oppurtunity and 128 tatami were shipped to Ireland bound for Ikeda Dojo Wicklow, Sligo Aikido Dojo, Phoenix Dojo and to Drogehda. A huge thanks to Roman and Mario of the SAA, to Joe McHugh for facilitating the order and transfer. Also to Norberts friend Balasz for helping with the transfer, not forgetting Martin Danic of the SAA who helped to store the mats for us until they could be picked up and brought to Ireland. 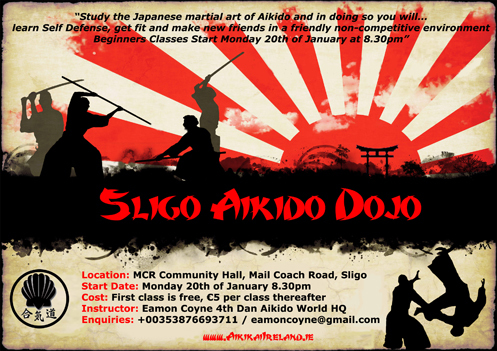 We now have plenty more space for Aikikai Ireland students to enjoy their Aikido practice. Uchida Tatsuru 7th Dan making this major milestone for thr organisation. 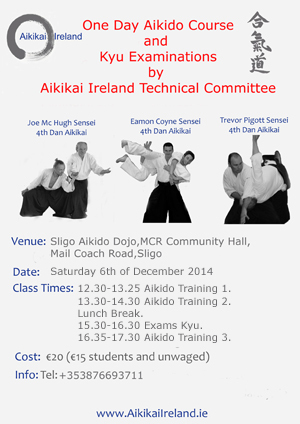 On Saturday 6th of December Sligo will host a one day Aikikai Ireland Technical Committee course with Kyu exams on the day also. 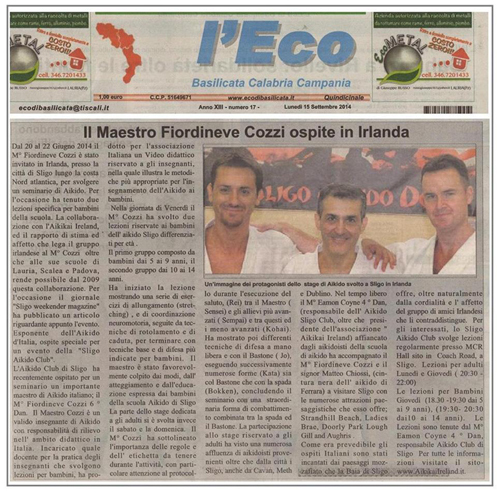 The recent course with Fiordineve Cozzi Sensei in Sligo Aikido Dojo has gotten coverage in the Italian l'Eco Basilicata Calabria and Campania newspaper. A big thanks to all of the guys at l'Eco for the article and allowing our Italian friends to hear about it. Click below for both the Irish and Italian media coverage in bigger format. 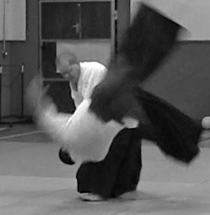 The pictures from the recent Aikikai Ireland Technical Committee Seminar and Kyu Grading session held in Sligo are now up. Well done again to all the successful grading candidates. 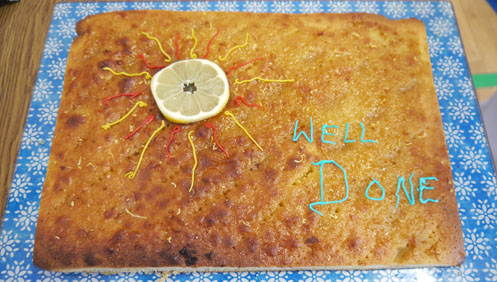 Thanks to Bea Schmidt for the lovely lemon cake in the pic above..."delicious". 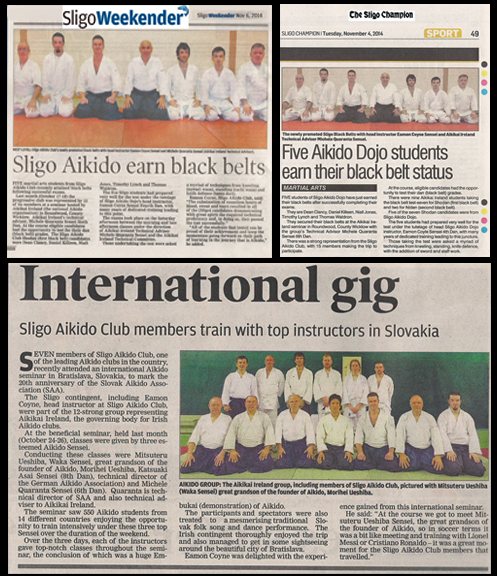 The recent course with Fiordineve Cozzi Sensei 6th Dan Aikikai that was held in Sligo Aikido Club has gotten great coverage in one the Northwest of Irelands biggest newspapers the Sligo Weekender (www.sligoweekender.ie). A big thank you to Liam Maloney sports editor of the Sligo Weekender, who was kind enough to publish the article for us. 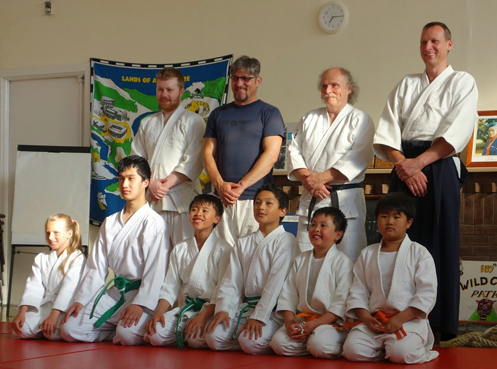 Pictured are the successful candiates with their instructor Eamon Coyne 4th Dan Aikikai. Well done on your achievement, onwards and upwards!!! 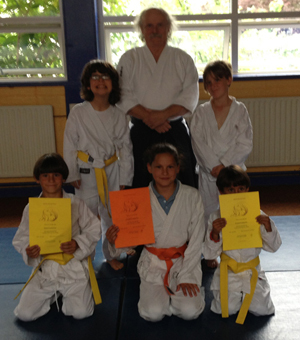 Pictured here are some more Ikeda Dojo Wicklow kids class students that have passed their recent grading. 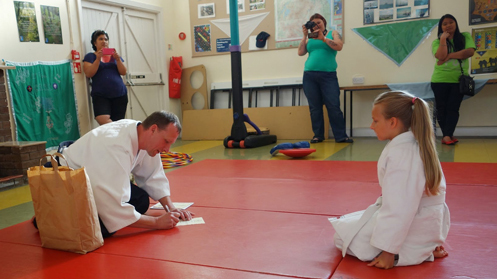 The students were put through their paces by dojo instructor Joe McHugh 4th Dan Aikikai. Joe Sensei was very happy with the students performance during the grading and the development of each of the candidates..
Keep up the good work folks!!! You done yourselves, intructors and dojo's proud. Pictures from summer camp with Michele Sensei now up!!! 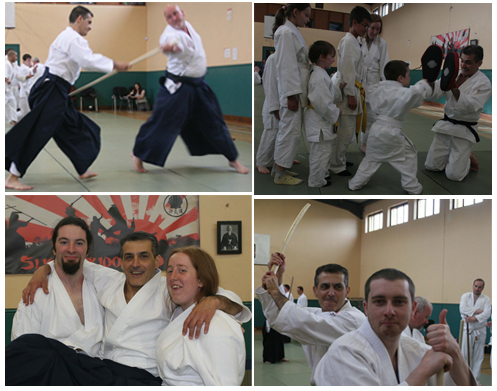 Pictures taken by Declan Bray from the brilliant residential camp with Aikikai Ireland Technical Adviser Michele Quaranta Sensei are now up see link below. 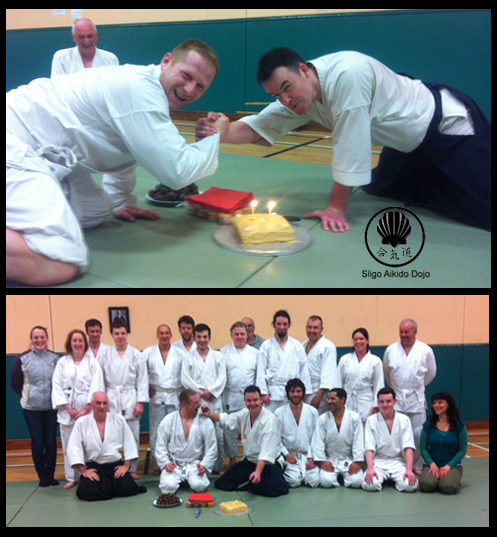 The course coincided with the 5th anniversary of the Aikikai Ireland group, we held a party to mark the occassion with plenty of ceol agus craic enjoyed by all. Thanks to Declan for some great shots and once again thanks to all attendees for making the course such a memorable one!!! 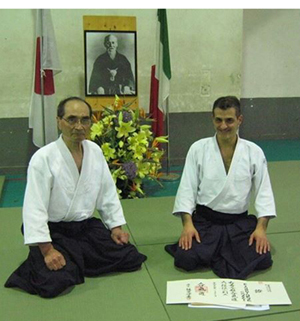 Pictured here is Fiordineve Cozzi Sensei receiving his 6th Dan diploma from Tada Hiroshi Shihan 9th Dan Director of Aikikai d'Italia. 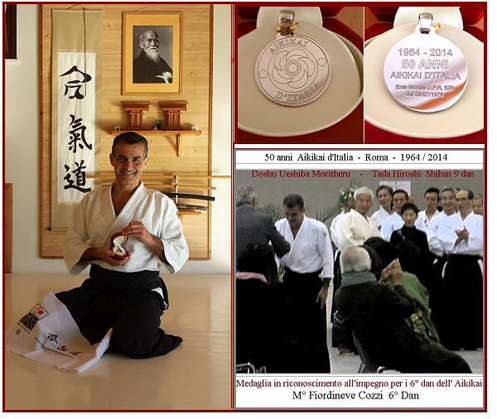 A hearty congratulations to Fiordineve from all at Aikikai Ireland on this achievement. Another fantastic course with Michele Quaranta Sensei!!! 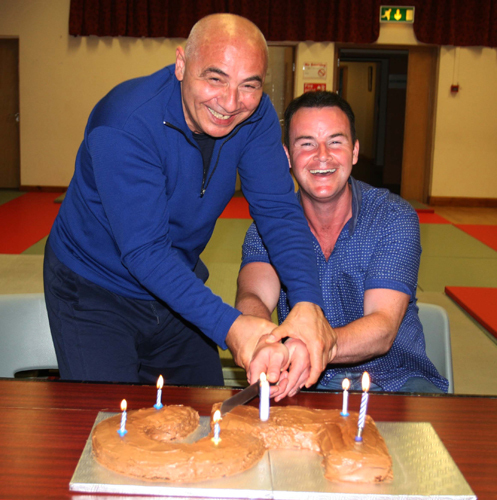 What a fantastic course with Aikikai Ireland technical adviser Michele Quaranta Sensei was enjoyed by all in attendance in the superb new facilities in Athboy, Community School. 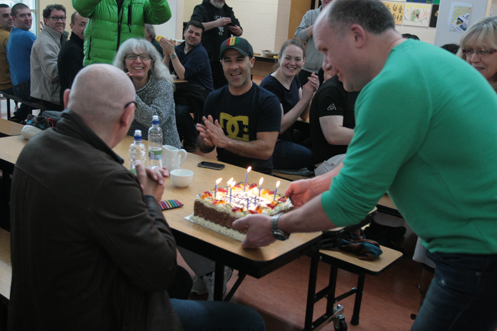 A huge thank you to all that helped facilitate another memorable Aikikai Ireland course, particularly Will Baker for some trojan work behind the scenes. Click below to see some great pictures taken by Declan Bray. 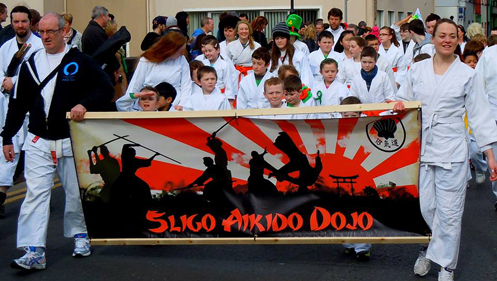 For the first time ever Sligo Aikido Dojo entered the Sligo St.Patricks Day Parade. Sligo has the honour of being the European Town of Sport for 2014 and also hosting the Fleadh Cheoil music festival so there was a strong emphasis on all things sports and music related in the parade. Thousands of spectators lined the streets for the parade which completes a lap of the city centre. At various flash points of the parade, club instructor Eamon Coyne performed a demonstration with club members Dean Clancy and Piotr Cichon, no easy task considering there were no tatami to fall on when falling from Koshinage ;-)... Great job lads!!! Club instructor Eamon would just like to thank all of adults and kids that helped out in the parade that day and done themselves and the dojo proud. 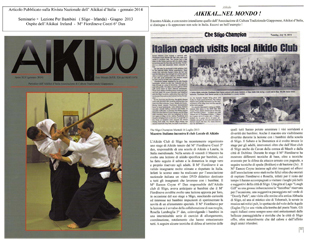 The Aikikai Ireland course hosted by Sligo Aikido club with Fiordineve Cozzi Sensei 6th Dan last summer has gotten coverage in the national Italian Aikikai Magazine. 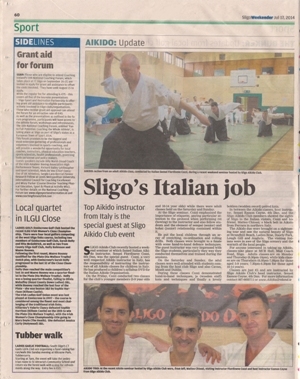 Aikikai Ireland and Sligo Aikido dojo would like to thank those involved in the Italian Aikikai for publishing article.You can view the article by clicking on the link below. 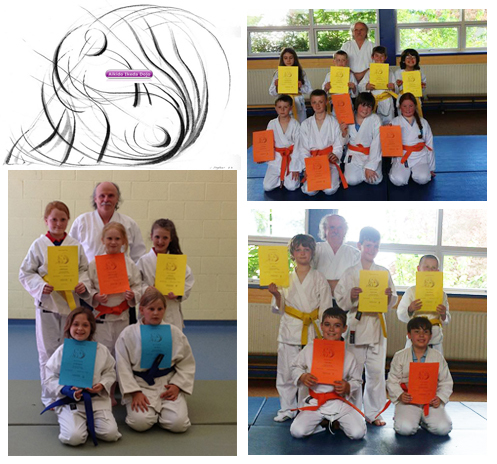 recent promotions to 5th Dan!!! !